What is the downside of inflation? What are the positive outcomes of a growing money supply? What other benefits and vulnerabilities can a growing token supply bring to a token design? Imagine you are a student on a budget. Let’s say your daily budget for meals is $15. It’s 7PM and you just got out of your last lecture of the day. And, you’re starving. Suddenly your heart sinks as you think about your budget — you already spent $14. Only $1 left you are willing to spend today. Good thing there is a cheap pizza place on the way home, and they sell pizza for $1! But what if you were in the same situation next week, after a period of inflation — would that change your willingness to buy a slice? After a period of inflation, that $1 doesn’t go as far because the price of pizza went up to $1.50. You can purchase less with that same $1 now than you could before. No pizza for you. As your purchasing power diminishes given your current income — you will look to increase that income and ask for a raise. Following a rise in consumer prices, it is common to see a rise in wages. However, this can lead to a loop — as a rise in wages can increase consumer spending as well as the costs of production, which in turn pushes price up again. This is known as an inflationary spiral. Although it could seem easy to avoid an inflationary spiral, targeting inflation is in fact an imprecise and indirect process subject to uncertainty. In traditional economies, Central Banks are responsible for increasing or decreasing the money supply — one could think of it as “printing” or “burning” money; though, it is actually the Treasury which physically does this. The objective of Central Banks is to ensure financial stability. For the vast majority, this is accomplished through their mandate to stabilize inflation through explicit target rates or ranges. There are 2 primary ways that Central Banks target inflation: 1) buying or selling assets, and 2) adjusting the interest rates they charge to banks — together known as monetary policy. Unfortunately, these tools have a limited pass-through to prices and interest rates within the economy. The ability of Central Bank policy to affect inflation is known as the transmission mechanism — characterized by long, variable and uncertain time lags. Thus, it is difficult to predict the precise effect of monetary policy actions on the economy and price level. 3. What are the positive outcomes of a growing money supply? It is important to note that a growth in the money supply does not necessarily lead to inflation if there is an equal growth in the value of the goods and services in an economy. In fact, it could be argued that a productive and growing economy requires a growing money supply to support it. 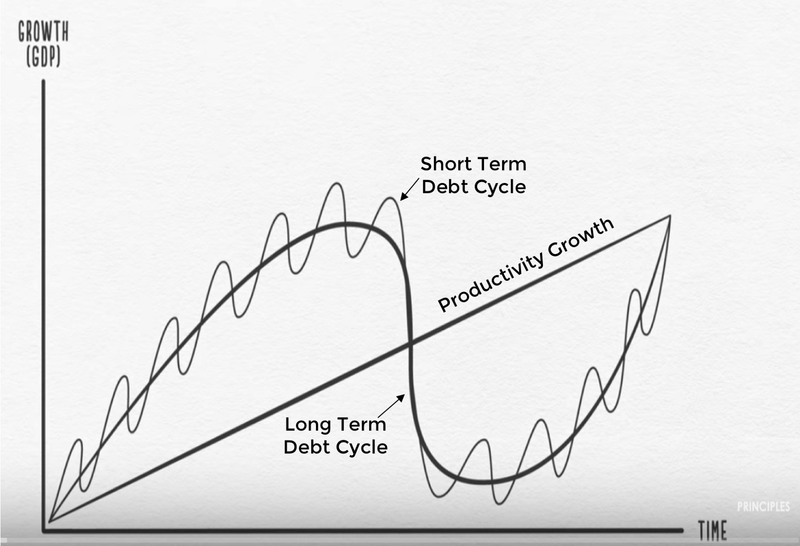 Though such a system can be more productive over time, it is prone to financial instability due to the debt cycle (business cycle fluctuations) and the difficulty in targeting inflation. Despite this difficulty, the vast majority of economies choose to target some amount of inflation. This has a couple benefits for Central Banks and Governments — as it decreases the cost of debt over time and allows for monetary policy flexibility. Perhaps even more important: a growing money supply encourages investment in productivity growth in the short run. Imagine you have a great idea for a new company. If the money supply is stable and you have a well-paying job, there is very little incentive for you to take the risk and break out on your own to start this company. However, with a growing money supply (before prices and wages rise), there is a greater incentive for you to make an investment in your idea with the possibility that it could return more than you are currently making. At the same time, a growth in the money supply causes the real interest rate to drop. That leads to a desire on the part of investors to find higher returns in higher risk ideas. More investment in great ideas today leads to greater productivity for the economy in the long run. 4. How can a growing token supply support the growth of a token-based economy? Just as a growing money supply supports the productivity and growth of a traditional economy — a productive and growing token-based economy requires a growing token supply to support it. A growing supply of the token will create incentives for more consumption and investment within the network and lead to greater productivity and value in that economy in the long run. As well, a growing token supply, when used to pay for the work and security of the network, supports the growth of the token-based economy. It enables the network to achieve its highest value. Let’s take an example of a network that rewards Validators of transactions. To achieve an optimum level of transaction load (to achieve the highest value of the economy), both fees and growing token supply should be used as expenditures of the network. Meaning, Validators are paid fees by users for validating transactions — and they are also rewarded with the growing token supply. If only fees were used to pay for transactions, the system would reach a lower equilibrium value and incur a deadweight loss for this security payment. When this security payment comes from both fees and a reward from a growing token supply — a more favorable equilibrium is reached. 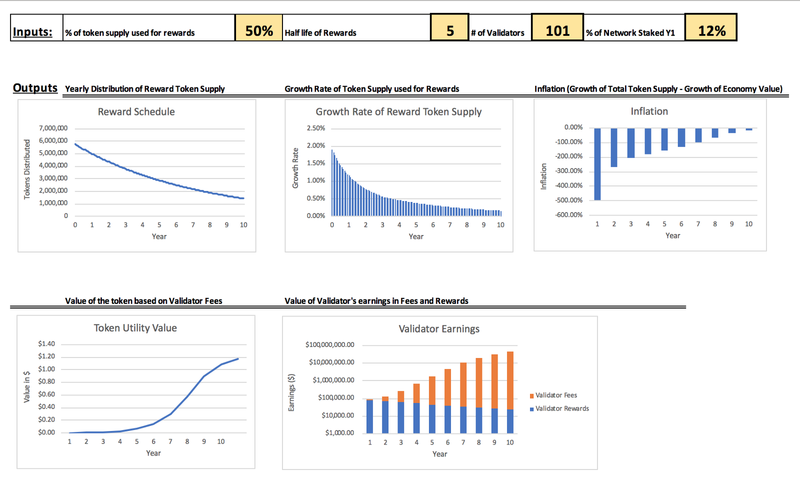 Take a look at this basic model, it is just a start, but hopefully it lets you see how adjusting the inputs affects the value of the economy as well as the incentives of the Validators. As the growing token supply gets distributed to Validators, it creates an incentive to invest that supply in the network. There is a greater incentive to increase stake to therefore increase potential for income. The result is a larger margin of security and greater level of transaction load in the network. 5. What other benefits and vulnerabilities can a growing token supply bring to a token design? What work is valuable to this system? Who is eligible to receive the newly minted supply? What work are they performing that is valuable to the network? What percent of the token supply should be used to pay for the work? What is the optimum rate of growth of the token supply? Using models (like the one in this post) can be crucially informative to understand the implications of these variables on your economy — as well as the potential vulnerabilities. For instance, identifying if the network needs to spend on security itself. If not, it becomes an unnecessary premium that would get forked away. To be effective, the growing supply should directly pay for the security. Instead of, for example, going to everyone in the network as a dividend — regardless of who is doing the work to secure the network. Although models and simulations are an important part of the design process, there will be some things we learn through practice. It is still unknown what the optimum balance of rewards versus transaction fees is. Or the optimum level of inflation for these various types of economies. Best practices would dictate building models and simulations to examine these consequences before the network is live and real value is at stake! Even so, there is a lot more we are going to learn in practice over the coming years. Thank you to Nicky Case for the inspiration to create explorable explanations, Nathan F. and Ali R.Z. for checking my econ, and Jeff Emmett.